David F. Heatwole is an 11th generation artisan and is the founder of Transcendental Arts Council aka. The Arts Collaborative.org. 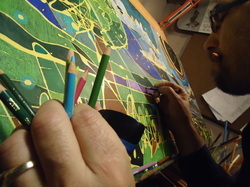 Not only is he a painter but he considers himself an Art Director for community collaborative art project. He considers art to be a wonderful tool for uniting people and to work as art therapy for individuals and communities alike. Many articles have been written about Heatwole and his mission both as an artistically as well as a father. Heatwole has won numerous awards for his art and was recognized, with his wife, as 2009′s ”Angels in Adoption” from West Virginia.